After analyzing the reciprocity licensing proposals and previous studies on the subject, the conclusion seems to be that a reciprocity license alone can’t reflect all of the necessary conditions for the regulation of commercial transactions given that they are authorized for commons. In particular, it seems a compromise to draft consensus terms since they are based on moral values. 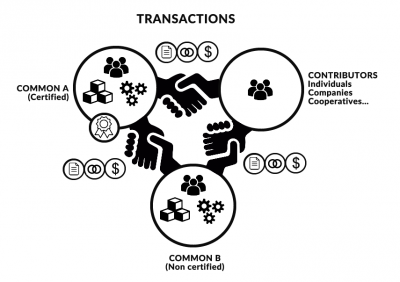 A Contributive Commons Label which is a peer-to-peer self-agreement. 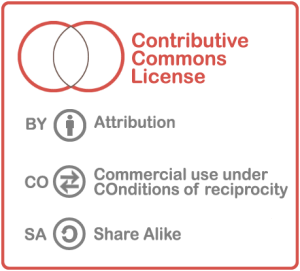 A Contributive Commons License: inspired by Commercial Creative Commons licenses (CC BY and CC BY SA), it adds conditions to the commercial use of commons. The license defines the general conditions of access and diffusion, but it withdraws the conditions of commercial use in a different document called a « social code ». A Social Code: text that defines the bundles of qualities, values, rights and wealth of the common, and contains a reciprocal matrix. A Reciprocity Matrix: equivalent to a rate schedule that clearly indicates contributors’ conditions of payments depending on the use made of the common. This matrix is in the social code. A money: unencrypted and abundant, it is just to clarify the interaction between the labeled commons. Principle of inclusion: any contact being allowed to use the common (including commercial use) is necessarily a contributor whose contribution is received with goodwill by the community regardless of the form of this contribution (including whether it is money). A contributor (individual, company, cooperative, common …) does not necessarily have the label, but shall accept in full knowledge the terms of the transaction proposed by the common. Any user of the common is encouraged to also be a contributor (an expression of gratitude or the payment of a sum of money are contributions). Each common decides the conditions of reciprocity it wishes to include in its social code and reciprocal matrix. This allows endless possibilities, depending on the values and objectives of each community. Example: a common shares a resource with another accredited common, but requires a financial contribution to a non-accredited contributor. To use the Contributive Commons License, a common necessarily must have the Contributive Commons Label. This principle requires to establish a digital notaries guaranteeing the validity of a Social Code on the date of the transaction. the wealth recognized by the community (monetary or not), its funding sources, and how it intends to manage their flows according to different categories of contributors, in the form of reciprocity agreements or reciprocity matrix (possibly including sharing, donation and gratuity) and a description of the redistribution of internal flow. to ensure that the essential points of a typical commercial contract are met. To use the Contributive Commons License, a common will necessarily have the label. To access this label, a common will necessarily have drafted its Social Code (describing bundles and a reciprocal matrix) to enable a community of peers to assess the common. 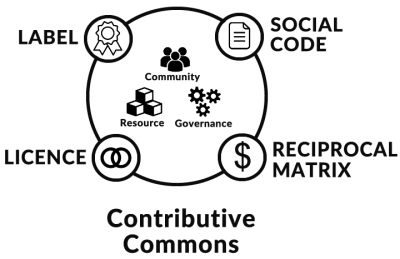 The Contributive Commons Community is today an informal collective that reflects and tests the principles proposed on the site. Eventually, it will be structured around governance so as to deliver the Contributive Commons Label via a peer committee. This structure could be supported locally by the Chambers of the Commons. A first concrete experimentation will be born in Lille (France) in the form of the association Contributive Service for Commons L1 (being established). Commercial use under conditions — You are permitted to make commercial use of this work, all or part of the hardware if you meet the criteria of a « contributor » in the Social Code of the common covered by this license, and if you settle the possible fee contributory mentioned in the reciprocal matrix indicated in this Social Code. Notices : This is a human-readable summary of (and not a substitute for) the complete license. It is not a license, It is not a license and has no legal value. You should carefully review all of the terms and conditions of the actual license before using the licensed material. Contributive Commons is not a law firm and does not provide legal services. Distributing, displaying, or linking to this deed or the license that it summarizes does not create a lawyer-client or any other relationship.